Another innovation from Kotz Drums & Percussion. Say goodbye to sore backs & necks. 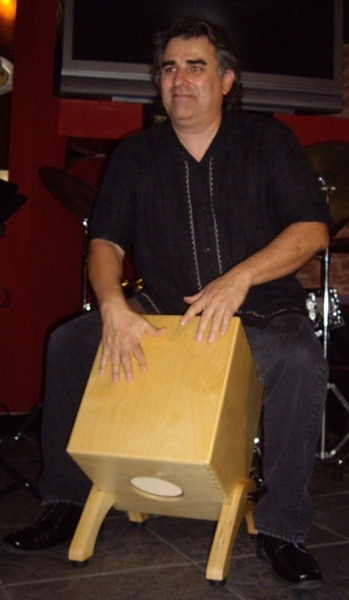 The Homero Chavez signature cajon is mounted at an angle on sculptural wooden legs allowing the player to maintain a comfortable upright playing position while sitting on a standard drum throne or chair. 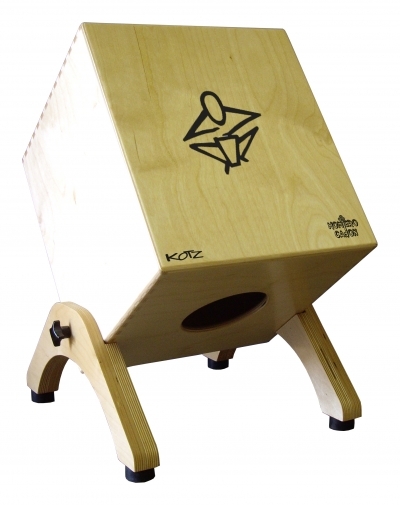 The free standing design allows the instrument to resonate freely creating deep resonant bass tones & crisp slaps as well as a wide range of intermediate tones rarely found on a cajon. A unique front mounted hole projects the sound towards the audience. Instead of sitting on this box, the player sits behind it & can comfortably play pedal mounted auxiliary percussion (cowbells, woodblocks, hi hats, etc). It's a lot easier than balancing while leaning back on a traditional cajon. The free standing design also enables the player to more easily reach other hand percussion instruments (congas, djembes, & bongos). This exceptionally tonal was designed for both live & studio applications. You won't find a more durable cajon as these road tested birch instruments feature dovetail joinery & heavy duty industrial hardware.